As soon as I acquired LaCie 2big Network (2-disk RAID) NAS drive, I discovered that it is much too noisy to be used in the living room space I had intended it for. Here I describe my steps in trying to get rid of the whining noise and the ultimate solution I found. One might be able to apply the solution to other Lacie disks as well, Quadra or d2 for instance. Always properly shutdown and unplug the device before trying any of the following. The procedures described in this guide likely void your product's warranty and may cause malfunction and data losses if you don't observer. 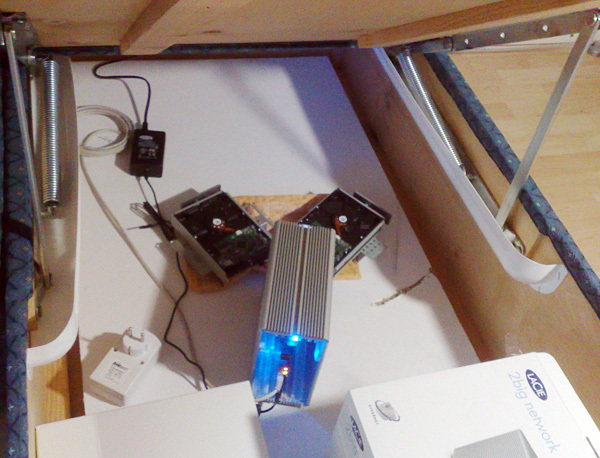 The drive includes a small, too small, fan which keeps the system cool. Some noise is also produced by the included hard drives. The case needs some cooling and the Lacie adminstration software indicates is the fan blowing enough. The fan is not operated unless the disks get warm enough. After borrowing a professional infra-red surface temperature meter I entered a number experiments to figure out how I could safely get rid of the sound without increasing the temperature of the discs above 40 degrees celcius, which seems to be within safe limits.